I am very proud to inform you that Wim Kegel's solo CD 'Drumwise' (duets with Marc van Roon) has been released! Drumwise presents Wim Kegel and Marc van Roon revisiting the traditional combination of drums and piano in a contemporary fashion. The repertoire recorded contains a broad repertoire made up of originals, improvisations, two songs from the American Songbook, and two from the Duke Ellington band book. Both musicians have played and recorded with David Liebman, Michael Brecker, Clark Terry, Bob and Chuck Findley and Ack van Rooyen. Kegel has been described as “Never too much, never too little, unexpectedly fierce and sometimes experimental”. 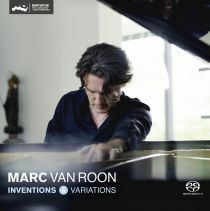 Van Roon’s own Steinway grand and Kegel’s extended Gretch drums and cymbals came together in the great acoustics of the Lutherse Kerk in Haarlem and were recorded by sound engineer Bert van der Wolf. Available in High Resolution Stereo & 5.1 Surround.